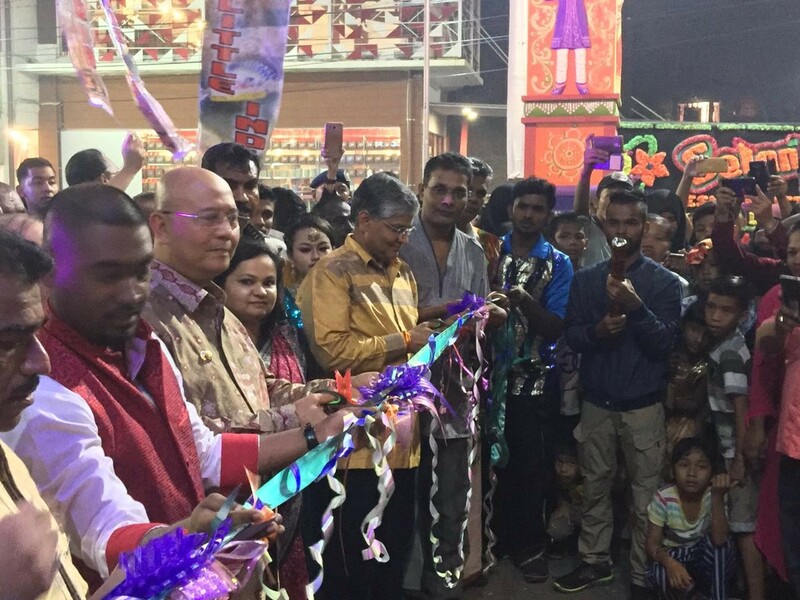 The inauguration ceremony of ‘Little India Gate’ was held today at ‘Kampung Madras’ or ‘Madras Village’ area in Medan city. The Little India Gate was inaugurated jointly by the Ambassador of India to Indonesia and Timor Leste H.E. Mr. Pradeep Kumar Rawat, the Mayor of Medan H.E. Drs. H. T. Dzulmi Eldin S, M.Si and Mr. A.S. Kobalen, the head of Gemasadhana, an organisation representing Indonesian Hindu and Buddhist communities in the presence of prominent local leaders like Mr.Parlindungan Purba, the Senator from North Sumatra province and Mr. Iswanda Nanda Ramli, member of the North Sumatra legislative assembly. The event was also attended by leaders of various Indonesian-Indian associations belonging to Hindu, Muslim, Sikh, Buddhist and Christian communities. About 7000 people witnessed this historic moment with great enthusiasm. The event began with prayers according to Islamic, Hindu, Christian, Buddhist and Sikh traditions delivered by priests from the Indian community as a symbol of religious harmony and tolerance which is a characteristic feature of multicultural and multiethnic Medan city. The Ambassador in his speech said that the event was a true representation of what Indonesia stands for , which is, ‘Bhinneka tunggal Ika’ or Unity in Diversity’ and also the Indian belief in ‘Vasudev Kutubakam’ or that the world is one family. He thanked the Mayor of Medan for supporting the event and assured that the Indian embassy in Jakarta and the Indian Consulate in Medan would also assist in promoting Little India Gate as an important tourist destination in Medan, especially for Indian tourists. He added that Little India could also become a bridge between the two countries in terms of trade and commercial relations. He also thanked and appreciated the organising committee of the Little India Gate and Mr.A.S. Kobalen for taking this initiative and the community members for supporting the event. The Mayor in his speech said that inauguration of Little India Gate would go down in the history of Medan. The Little India Gate will be promoted as an iconic tourist spot in Medan city as this is the first such structure in entire Indonesia. He added that the gate also represents the immense potential in the Indian community and a recognition of their contribution in the development of Medan. Mr.Purba, the Senator from North Sumatrain his remarks urged the city government to develop the area in the vicinity of Little India Gate as a hub for Indian art, culture, cuisine and Indian products. The event also consisted of musical and dance performances including famous Bollywood numbers performed by local Indonesian artists. Kampung Madras area ,is also known as the Little India of Medan, Indonesia, and is one of the city's significant ethnic enclaves comprising of a large population of people of Indian descent whose ancestors had settled down in Medan in mid-nineteenth century. Every year, Kampung Madras becomes a meeting point for Hindu and/or Tamil festivals such as Thaipusam or the Tamil New Year, Pongal and Diwali. Not only is it home to one of the oldest Hindu temples of North Sumatra Sri Mariamman Koil but it also houses mosques belonging to the South Indian Muslim community, Churches including an Indian Catholic Church that dates back to 1912, a Gurudwara and a Buddhist temple.